Superdry women’s Vintage logo emboss tape hoodie. This hoodie is a stylish layering item with a creative twist. 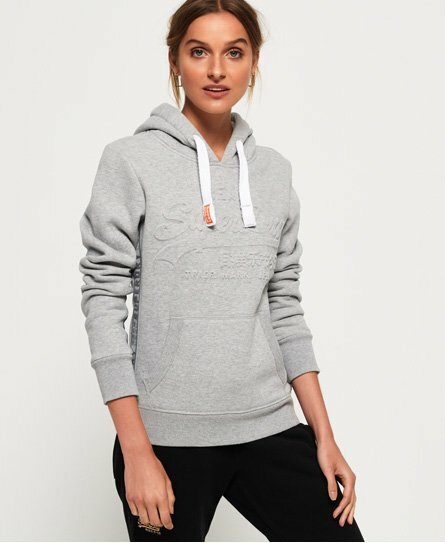 This hoodie features a Superdry logo embossed on the chest, a draw cord hood and Superdry logo taping on the inside of each sleeve and down the sides of the hoodie. The Vintage logo hoodie also features a front pouch pocket to hold your phone and keys and ribbed cuffs and hem for a comfortable and flattering fit. For the finishing touches, this hoodie has the signature Superdry orange stitch in one side seam and a Superdry tab in the other.